Photos above are of actual patients. With Tumescent Liposuction, men with gynecomastia can stop feeling embarassed about their chests. 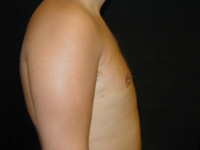 Featured on ABC's 20/20, Tumescent liposuction is a surgical technique that reduces male breasts in just one hour. Areas that can be treated with liposuction include the chin, arms, breasts, abdomen, back, hips, thighs, legs, calves, and buttocks. 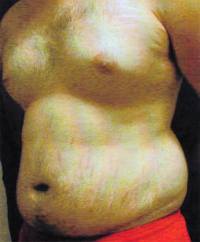 Many men use liposuction for Gynecomastia (enlarged breasts), chin, and love handles. Dr. Mirabadi is happy to answer your questions in your free, private, twenty minute consultation session. During the consultation, you will have the opportunity to view many more before and after photos.